A combination of diet and exercise changes is the most effective way for post-menopausal women to lose weight and body fat, according to a study published in Obesity in 2012. Eating fewer calories while maintaining a high intake of protein and fiber and exercising about an hour each day are among the more effective changes you can make for weight loss. Check with your doctor before starting this new plan, however, to make sure it is safe for you. Your metabolism slows as you age, so you'll likely need to work harder to lose weight than you did in your 20s and 30s. After age 20, your metabolism decreases by about 2 or 3 percent each decade, mostly due to losing muscle mass. Decreasing caloric intake by about 150 calories every 10 years may help limit weight gain caused by this slowdown. How many calories you should eat per day to maintain your weight varies based on activity level. A 60-year-old woman who isn't active needs about 1,600 calories per day, one who is moderately active needs about 1,800 calories per day and one who is active typically needs between 2,000 and 2,200 calories per day. To lose about 1 pound per week, you need to get 500 fewer calories than you burn each day. That could mean eating 500 fewer calories than your needs, burning an extra 500 calories through exercise or some combination of the two. Never eat fewer than 1,200 calories daily or you'll risk nutrient deficiencies -- if you're sedentary and need just 1,600 calories daily to maintain your weight, you could cut your calorie intake by 400 calories and burn the extra 100 calories through exercise. The U.S. Department of Agriculture recommends a person of this age needing about 1,600 calories per day eat 1.5 cups of fruit, 2 cups of vegetables, 5 ounces of grains, 5 ounces of protein-rich foods and the equivalent of 3 cups of fat-free milk in dairy products each day. Protein sources should be lean, such as seafood, skinless poultry, eggs and legumes, and grains should be whole grains. Try to get 25 to 30 grams of protein in each meal, as this may help decrease muscle loss. Avoid "junk" foods high in saturated or trans fats, as well as added sugars -- these foods are often loaded with calories but offer little nutritional value. A sample day could include a breakfast of an orange or a cup of berries, a cup of oatmeal and a cup of nonfat yogurt. For lunch, try 2 ounces of turkey and 1 ounce of cheese on two slices of whole-grain bread served with a cup of salad and an apple. Dinner could be 3 ounces of tuna, 1 cup cooked broccoli, a glass of milk and 1/2 cup of quinoa. The minimum recommended aerobic exercise for older adults is two hours and 30 minutes per week of moderate exercise, but for weight loss, you'll need to get about twice that much exercise. Try to participate in some form of aerobic exercise, such as walking or swimming, for an hour most days of the week. Women who aren't as fit can break this down into multiple segments of 10 or more minutes of exercise spread throughout the day. Exercise should be difficult enough that you can talk but not sing. A 154-pound person burns about 280 calories per hour of walking at 3.5 miles per hour and 290 calories per hour of biking at less than 10 miles per hour. This can make a big dent in the 500-calorie-per-day deficit needed to lose 1 pound per week. While participating in strength-training workouts may not burn a lot of calories, it can help older adults minimize muscle loss and decreases in metabolism. Once adults turn 30, they lose between 3 and 8 percent of their muscle mass every 10 years if they don't participate in strength training. 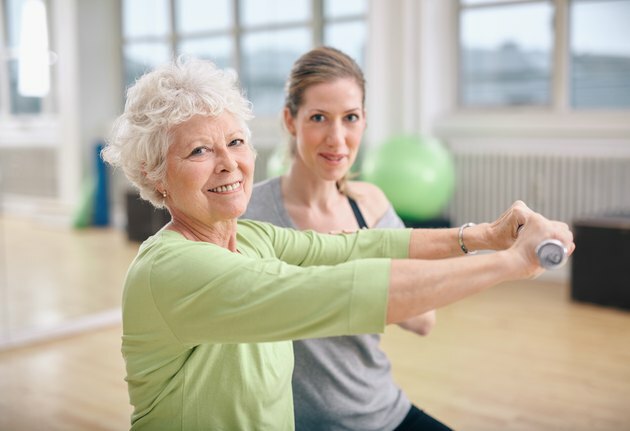 Strength training may also help older women maintain their bone density and improve their balance and coordination, which makes it easier for them to remain independent for longer and helps prevent falls. Aim to complete at least two of these workouts per week, including 10 to 15 repetitions of exercises that target the arms, chest, shoulders, back, abdomen, legs and hips. Don't work the same muscles two days in a row to avoid overtraining, and get creative with at-home workouts using soup cans or water bottles as light weights. As the exercises get easier, increase the weight so that it is difficult to complete the exercise eight times in a row -- once you can complete eight repetitions, up the weight again to continue your progress. Squeezing a tennis ball as hard as you can for about five seconds at a time can help improve your hand strength, while doing wrist curls while resting your forearm on the arm of a chair and holding a weight can increase your wrist strength. Arm curls, arm raises to the side and the front and overhead arm raises that start with your arms bent and your hands at your shoulders all improve arm strength. Other arm exercises include seated rows, chair dips and elbow extensions. You can improve chest strength by doing wall pushups, and raising your legs behind you or to the side while holding onto a chair for balance will help strengthen your legs. Knee curls, standing up from sitting on a chair and raising yourself up so you're standing on your toes are also good ways to increase leg strength. Stepping onto and off of a step while holding the handrail for balance is another good leg-strengthening exercise, and you can strengthen your abdominals and rear end by lying on the floor with your knees bent and raising your hips to do pelvic tilts. Lying on your stomach and raising your head as well as opposite arms and legs also strengthens your back.